From time to time you write a post that just seem to get search engine hits over and over again. I don’t understand enough about google to be able to tell you exactly why, and sometimes it’s not clear what people are actually looking for. For years my top post was about MXit – a very popular South African mobile IM client, accounting for up to 20% of blog visits at a certain stage. The MXit post is way down at 2 views for the past 30 days. The burning bibles/wasting nature post is a short reflection on the Belgic Confession article 2 and ecology. The interesting this about this post is that the views has drastically increased over the past few months, as can be seen in the picture below. It started out getting a few hits, as usual, then quited down totally, as usual, and then from October last year started getting more and more hits. My first guess was that Coopenhagen was the culprit, and that the increased awareness about ecology caused an increase in searched. 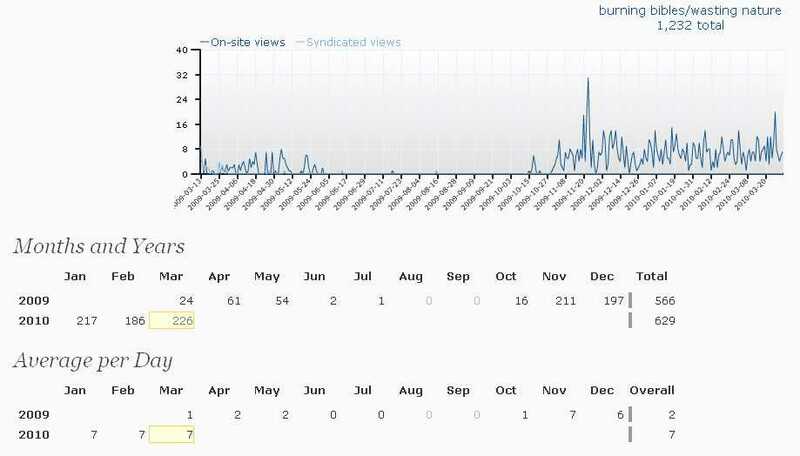 But, from the WordPress stats, it would seem like the searches used to get to the post was linked to “burning”. “burning book”, “burning books”, “burning picture”. Now what would cause this? Yes, it’s strange how some posts seem to attract lots of readers, and others very few – often in inverse proportion to the care one has taken in writing them. The one that seems to attract most readers on my blog was one that I tossed off carelessly as a rather lame joke, while ones that I took some care in writing seem to have few readers.